New for 2018: Upgraded TVs and Remodeled outdoor shower. 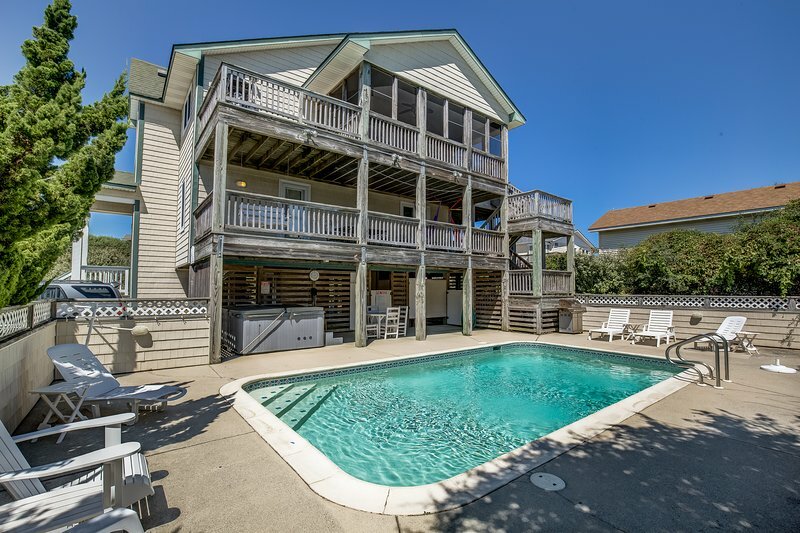 This is your ‘Summer Place' for fun in the sun on the Outer Banks. Highlights include a 60” LCD TV in the Great Room, a screened porch for meals or relaxing, and the option of having one or two family suites on the mid-level. Great location on Ocean Blvd just off Duck Road, and the deck walkway takes you to a quiet dead end street straight to the beach. . .easy! Besides the pool and hot tub, even the tots have been considered with a sandbox in the shade and a grill for the chef in the middle of the action. Bring the bikes, this quiet street offers a short ride to the miles of multi-use paths for jogging, strolling or biking throughout Southern Shores and Duck. Centrally located between the quaint village experience of Duck, and the activities and shopping available in Kitty Hawk. Top-Level: Great Room with 60” LCD TV, DVD, Sectional, Deck Access, Kitchen with Stainless Steel Appliances, Dining Table seats 10, Bar seats 3, built in benches with chairs and table, Access to Screened Porch overlooking Private Pool, Table seats 6, Hall Bathroom, King Bedroom with Deck Access and 38” LCD TV. Mid-Level: Bedroom with Twin and Duo Bunk with Deck Access and TV/DVD/VCR, shares Jack and Jill Bathroom with King Bedroom with LCD TV and Deck Access; King Bedroom with Deck Access and TV/DVD/VCR, shares Jack and Jill Bathroom with Bedroom with Twin and Duo Bunk and Deck Access. Laundry with washer/dryer in the hall. Ground-Level: Covered Parking for 4, Private Pool, Hot Tub, Sandbox, Outside Shower, Deck Walkway to street for beach access. Extras: Private Pool (14 x 26), Hot Tub (6), Wireless Internet Access, DVD players, High Chair, 2 Gas Grills, Screened Porch, Fire pit, Community Amenities Available, No Smoking, PETS NOT ALLOWED, Parking: 4 cars, Distance to the Beach: 325 ft.
New for 2018: Upgraded TVs and Remodeled outdoor shower. This is your ‘Summer Place' for fun in the sun on the Outer Banks. Highlights include a 60” LCD TV in the Great Room, a screened porch for meals or relaxing, and the option of having one or two family suites on the mid-level. Great location on Ocean Blvd just off Duck Road, and the deck walkway takes you to a quiet dead end street straight to the beach. . .easy! Besides the pool and hot tub, even the tots have been considered with a sandbox in the shade and a grill for the chef in the middle of the action. Bring the bikes, this quiet street offers a short ride to the miles of multi-use paths for jogging, strolling or biking throughout Southern Shores and Duck. Centrally located between the quaint village experience of Duck, and the activities and shopping available in Kitty Hawk. Top-Level: Great Room with 60” LCD TV, DVD, Sectional, Deck Access, Kitchen with Stainless Steel Appliances, Dining Table seats 10, Bar seats 3, built in benches with chairs and table, Access to Screened Porch overlooking Private Pool, Table seats 6, Hall Bathroom, King Bedroom with Deck Access and 38” LCD TV. Mid-Level: Bedroom with Twin and Duo Bunk with Deck Access and TV/DVD/VCR, shares Jack and Jill Bathroom with King Bedroom with LCD TV and Deck Access; King Bedroom with Deck Access and TV/DVD/VCR, shares Jack and Jill Bathroom with Bedroom with Twin and Duo Bunk and Deck Access. Laundry with washer/dryer in the hall. Ground-Level: Covered Parking for 4, Private Pool, Hot Tub, Sandbox, Outside Shower, Deck Walkway to street for beach access. Extras: Private Pool (14 x 26), Hot Tub (6), Wireless Internet Access, DVD players, High Chair, 2 Gas Grills, Screened Porch, Fire pit, Community Amenities Available, No Smoking, PETS NOT ALLOWED, Parking: 4 cars, Distance to the Beach: 325 ft. Additional amenity details: Private pools are open from May 3, 2019 until October 13, 2019. This property is not equipped for pool heat. Pool heat is not an option for this property. Hot tubs are available from March through December. All Outer Banks Blue properties provide bed linens, bath towels, beds made prior to your arrival, and a starter supply of: toilet paper, bathroom soap, paper towels, and dishwater detergent. Discounted H2OBX Water Park tickets available when you book with Outer Banks Blue.